Graphite pencil on paper – This was the first drawing that I did before I created Apollo Arts. 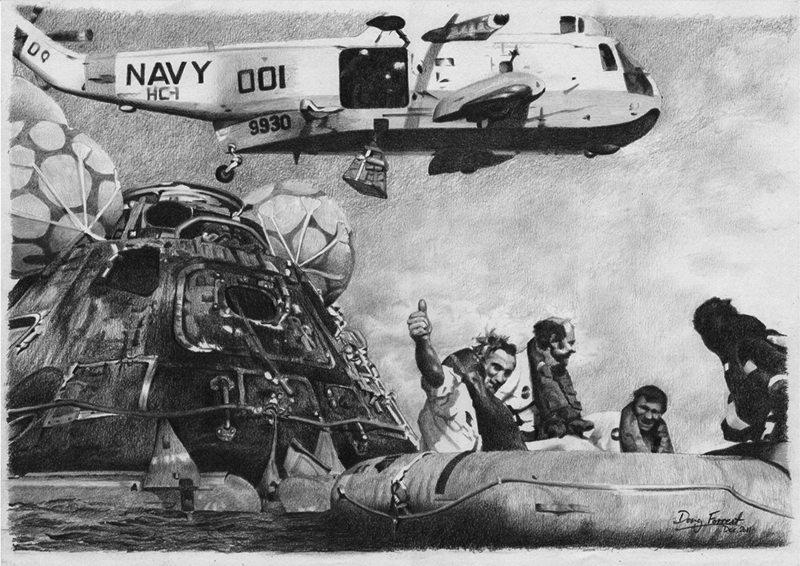 I drew this for my friend Alan Beuhler, who was one of the UDT swimmers that were first to the Command Module, when Apollo 17 splashed down, to round out the Apollo lunar missions. Alan took the photograph that I based my drawing on and I thought it had everything in the shot, except the USS Ticonderoga: the CM, the helicopter, all three astronauts and one of the swimmers. The best part though is Gene Cernan giving my friend the thumbs up, which I thought perfectly captured the feeling of a perfect program, mission and recovery.